Sitting in on the Kickstarter panel at the New York Comic Con, I found myself sharing many of the questions that were posed to the Benign Kingdom Creators, a Kickstarter team that raised well over $100,000 with their campaign: How can I create such a successful campaign? How do I build an audience that large? 2) Establish a digital following of at least 5,000 loyal fans. This can be through twitter, Facebook, or any other social network channel where you may actively communicate with people that may give you money. 3) Be published by a recognized comic book publisher (Marvel, DC, Image, Vertigo, Dark Horse, etc.). It helps if you are an active and popular creator for one of these publishing houses. 4) Win prestigious awards for your previous work or be a part of a prestigious anthology. I honestly have no idea how they determine this. I imagine that the Kickstarter staff sharpies the name of all new projects on to the shells of turtles and determine the staff pick via turtle race, but I’m probably way off-base here. Staff picks seem to be projects that are generally well put together or have an intrinsic heart about them that sets them apart from all of the vampire-fighting-zombies-in-a-world-ruled-by-werewolves type of book (though those get picked as well). 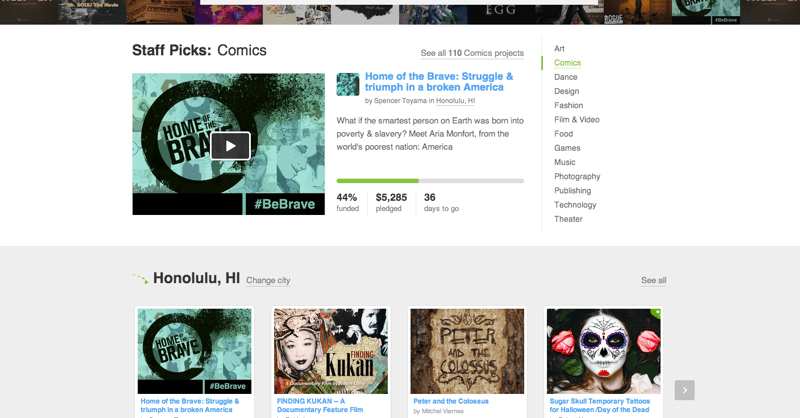 The selection of the Staff Pick comics leads me to believe that Kickstarter is looking for quality books that they know the creators are capable of completing. With this in mind, make sure that you do everything you can to have a quality product that you and all of your backers can be proud of. This is a section where I felt I had more control. My twitter following at the beginning of this campaign was around 80 in total. I had about 500 Facebook friends. The Facebook Page I set up for Home of the Brave was about 70 people strong. These weren’t huge numbers, but I thought about what “Popular” actually means in the Kickstarter landscape. Is “popular” measured by volume of pledges or the total dollar amount? Let’s assume that it could be both. Kicktraq gives some interesting analytics on projects, and has a comics section that’s easily accessible. From my findings, popular projects were getting anywhere between 10 and 40 pledges in a day (though the Nerdist Thrilling Adventure Hour Graphic Novel got 300 pledges in a day and $20k+, but this is an outlier). I made a calculated estimate that if I could get 20 or so pledges all at once, I had a good chance at making the Popular section in Comics, if not locally (which is another section on the front page). The idea being that I just wanted to be visible, and if I could corral my friends and family to support me heavily on the first day, my project would gain visibility to the Kickstarter audience. Getting on the popular section within the first 24 hours is crucial to a campaign, in that it can immediately launch you to the first page, and make you visible to a large section of the Kickstarter audience. The more amount of time you spend on the front page, the longer you remain visible to the audience. I created a plan for the first day launch, by time zones, and asked friends and family to be prepared to post my Kickstarter project on Facebook and twitter. Strategically, I knew we should launch on a weekday, when everyone is in front of their computers, receiving email and hopefully checking their Facebook and twitter feeds. I requested that my immediate circle of friends and family post in order of time zones, beginning with the East Coast and moving westward with the sun. The Kickstarter office is based in New York, so I was hoping that with enough early buzz, we’d have a shot at receiving a Staff Pick as well. -This may have been a little ambitious, as the average project on Kickstarter raises about $5,000. Short Blurb: What if the smartest person on Earth was born into poverty & slavery? Meet Aria Monfort, from the world’s poorest nation: America -The short blurb is very important, because this is your pitch. Without an enticing blurb, you won’t be able to attract an organic Kickstarter audience. Launch Date: Wednesday, October 3rd. -Again, a weekday launch was very important to us, as this is when people are in front of their computers. End Date: Saturday, November 10th. -Yes, we went longer than the recommended 30 days (and I would recommend that most people go for 30 days), but we wanted to take advantage of a few time-sensitive opportunities: New York Comic Con, my birthday (November 1st), and the presidential election. A lot of emphasis is put on the goals for Kickstarter, and you should definitely take a look at the Kickstarter.com/start section to give you a few ideas. The average amount raised for a project is $5,000 and the most common amount pledged is $25. If the $25 pledge is the sweet spot, then we want people to be able to easily escalate their pledges in ways that are enticing. For $10 more, we add signatures, and for $45 we include two autographed copies. In regards to the timing of our campaign, and there are a number of different strategies that one could use, we wanted to work our campaign around a comic con. We chose the New York Comic Con because it’s one of the largest comic cons in the nation after San Diego, but we also anticipated more Kickstarter comic book creators because that’s where Kickstarter’s offices are located. We also wanted to leverage my birthday (early November) as a fundraising opportunity. This made our campaign about 10 days longer than the recommended 30 days, and in retrospect 30 days may have been better, unless one is anticipating a huge splash in non-web media which often takes longer. The #kickstarter hashtag is important in that other members of the kickstarter community were already using it, and were possibly looking for other members of the Kickstarter community to follow. We were trying to build our audience as much as possible without having to launch a project to be a part of the Kickstarter community network. Key to all of this was to make the evangelism easy for our friends. They all had the same canned text to copy and paste, and I wasn’t asking people to pledge, I was asking people to repost the link. Reposting is significantly easier for people to do, and chances are they would pledge anyway. We also printed about 1,000 copies of the first 30 pages of our book to have as a giveaway for NYCC, local comic book shops, and NYC comic book shops. This was done to gauge the time and production steps for creating a book for the first time, as well as something to help build our audience. Aside from printing, we also released the first 30 pages as a PDF and as an iBook on the iTunes store using iBooks Author (it’s a lot easier than you think). Thanks Alexis. Nice plug, btw :) Your illustrations look great, and all of your rewards seem really thought through. Great job, and looking forward to the rest of your campaign. I give a lot of panels at conventions about how to do a kickstarter and the number one crushing piece of truth is the part where you tell someone they’re not going to get 100,000 dollars. The point made above about what it takes to get to 100k are absolutely correct. The only other part would be luck. You can send out hundreds of press releases and you never know who is going to find your project worthy of reposting. Thanks Cory! You are indeed a Slideshare master. Definitely need to talk later. PRM, I completely agree, and wanted to propose a panel to other cons on how to create a successful Kickstarter project. Which cons did you present at? I did a fundraiser on that other site, Indiegogo (‘cos I’m not in the US) and ended up getting on the front page of that site, but in the day I was up there, no extra funds were pledged to my project. All my pledges came from my own readers, as far as I know. @Caanan, this is the trend for most crowdfunding platforms, and the reason why I emphasize the first 24 hours. Almost all of your initial support hits from friends, families, and loyal supporters on the first day, with crowd-funding shoppers supporting because of the visibility gained on the first day. Thanks very much for sharing your experience and this data Spencer. I’ve read through the piece twice now, good points. Heidi, thank you for publishing this how-to. I launched a Kickstarter five days ago, every day has been a learning experience. The initial out-of-the-gate build up, having friends and contact review the page draft… all made a difference. PRM, I agree, so far the “luck” factor plays a HUGE role. Alexis, I’m headed over to pledge. @Joey, thanks for backing KidB and good luck on your campaign, I’ll be sure to check it out! I presented at Long Beach Comic Con and Comikaze Expo most recently. And it was a surprisingly popular panel! It went over very well! Great writeup with some really interesting ideas. If you’d be interested in talking about them some more, we’d love to interview you. My contact form is linked to my name on this comment. Just click “Contact form” afterwards. Great article with a lot of sound advice. We found the same things to be true when we ran ours. The $20 – $25 amounts were the most popular. If you can give them more for the money so the perceived value is greater, it really does help. We also wish we had stuck to a 30 day instead of a 45 day. I think in our case it would have been better to cut down the time frame as well. I also agree about building up to it before launching. I wish we had done more of that before we started. It gives people time to prepare and more time to spread the word. You brought up a lot of great points! I look forward to more. As well, I would like to ad that you should have the actual book almost done so people do not have to wait a half year to get their books. 3 to 4 months tops is the way to go. @Kambrea Thanks for the kind words and encouragement. @Jimmy Paliotti (trying not to fanboy out). I agree, and it’s something we had to struggle with, seeing as ours had a delivery date of July 2013, and that may have hurt our campaign. We’ll probably have a closer release date to our campaign for the second run of books. Great information! We have been having pretty good luck with our funding so far, but I am really trying to figure out how to get on that front page!!! The timed launch was a very ingenious idea. Check out our project if you get a chance – we don’t need $100,000, but every bit helps!